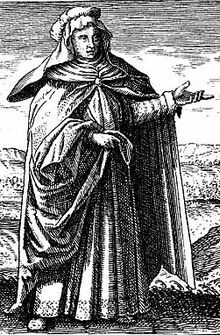 Mary the Jewess, aka Mary the Prophetess, is considered the first true alchemist of the Western World. None of her writings survive, but her works, sayings, and inventions have been preserved in works by alchemists from al-Nadim to Zosimos. Mary - probably Miriam, originally - lived sometime during the First to Third Centuries of the Common Era. Zosimos of Panopolis, a Fourth Century Gnostic Christian, is the first writer to mention her that we know of. She was said to be able to make caput mortuum (a purple dye that was a big deal among alchemists) and to have invented several pieces of alchemical equipment, some of which are still in use today - the bain-marie double-boiler, for instance.